So I haven’t blogged for almost 2 months and this wasn’t because I had nothing interesting to tell. Actually since my last blog I’m having the time of my life! These last 2 months have been incredible but my new blog is really overdue. Being away for a month and having to catch up with a lot of things when I got back just didn’t allow me to put any time into my blog. Since it’s been so long I’m probably going to cut this blog into smaller pieces. This whole evening was fantastic! The food was superb, the different wines tasted really good and the company was great. Unfortunately you can’t have all your good friends at the dinner table at once but having a meal like this with the 6 of us was really great. Each of the guys had its own personalized menu-item. Mine was the desert, which is normally my favorite course anyway. 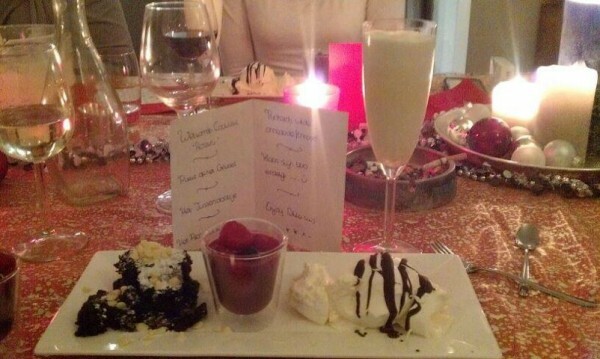 My girlfriend made “Richard’s Chocolate Fantasy”, a brownie, vanilla ice with chocolate sauce and a scroppino, my 3 favorite deserts in one! The evening went on till about 02:00 and unfortunately both my girlfriend and me had to work the next day. I had only three days of work left to do and since I wasn’t going to work a single day in January, it wasn’t a real problem to motivate myself getting out of bed. Those 3 days went by very smooth and I could finish 99% of my work before I left the office. Leaving my inbox with 0 e-mails, something that never happened before in those 12,5 years I’ve been working. 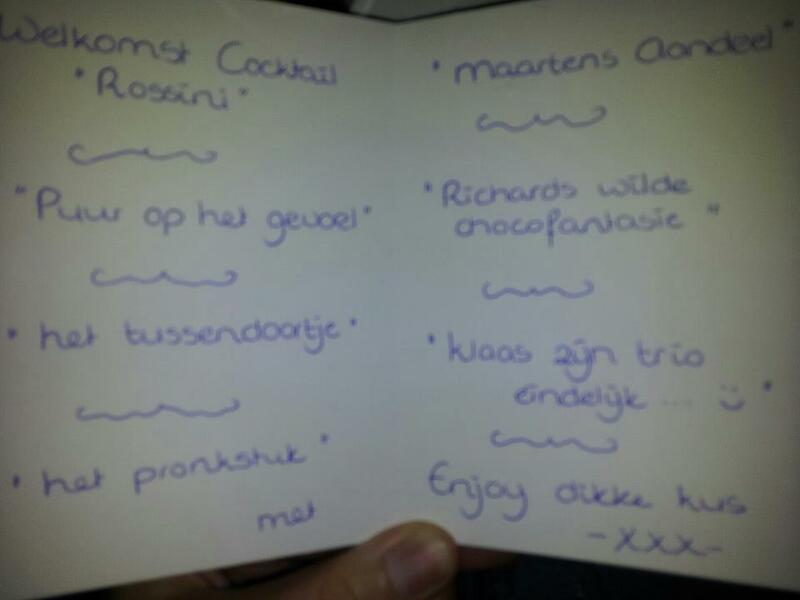 It was finally time for New Years Eve and some friends of us had organised a big private party. About 100 people, many which I call friends at a pretty deserted location so we could do anything we wanted without disturbing anybody. There was a theme to the party as well: “Bad Resolutions”. We partied till 05:00, everybody got really hammered and it was a really awesome party to start the year with. I definitely hope to do it again next year, same location, same people. I was smiling the whole evening anyway because in a couple of days I would fly to the Bahamas again! Knowing that you have 4 weeks to relax ahead of you is just the greatest feeling on earth. The plan to go to the Bahamas was put together pretty late and since last year I didn’t do a lot at the Bahamas I didn’t had a lot of expectations. I was hoping for some good weather to enjoy the pool/beach and had planned to play some poker, but due to the Dutch tax regulations it just doesn’t make sense to play a lot of tournaments abroad unfortunately. The first day, our Team Online manager Dustin had organised a meeting which started at 10:00. 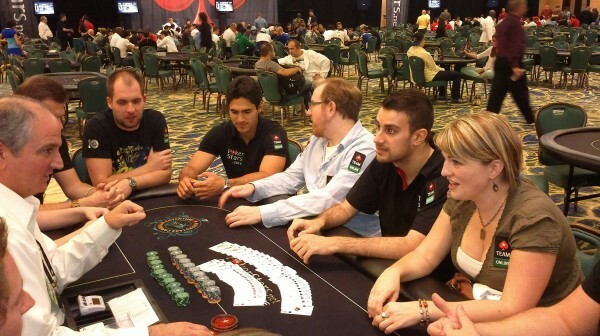 A pretty bizarre time knowing that 18 poker players had to show up but it worked out okay. I knew some of the Team Online members via Twitter, I read most of their blogs but I hadn’t met any in real life yet. Probably most of the other people had never met each other as well so we really started by doing an introduction of everybody. As being the only guy who plays LHE I explained how easy my game is by having only 3 options. Then Björn ‘Bjoerni89’ Schneider explained that he only had 2 options (Shove or fold) while playing since he plays Hyperturbo SNGs. It might be time to switch games 😉 A lot of people had similar backgrounds, some used to play Magic The Gathering (like I did), others were professional online gamers and others had a chess background. I also found 3 other Team Online members who played tennis, so a tennis match was quickly setup. The next day we had planned to go swimming with a small group. Tyler “frosty012” Frost (Canadian), Andre “acoimbra” Coimbra (Portuguese) & Diego “vgreen22” Brunelli (Brazilian) came along. It was probably around 25 degrees (Celcius) and Tyler and me were really enjoying the water. Andre and Diego were freezing and wanted to get out of the water asap! The next day Andre even brought a jacket to the pool, I guess for some people even the Bahamas can be a cold place. The next day I played tennis with Tyler, Diego and Shane “shaniac” Schleger and when warming up Tyler hardly hit any balls. On the other side, Diego was already killing it so the teams were made up pretty fast. Tyler had fooled us because his first serve was immediately a good one and again I remembered you always have to be careful not to get hustled when you are around poker players. Diego was by far the best player I had ever played tennis with, so playing some rally’s with him was a pretty big challenge. Obviously Shane and I lost but we did have a lot of fun. Later that week I also played a singles match against Shane. I think we were pretty equal and since we both played pretty safe we had some really long rallies trying to force the other into making the error. I had Shane on match-point but still lost the match, unfortunate but still happy about my overall game. Dustin had planned another diner with all the Team Online members at Mesa’s grill. It was a real good diner but what always happens when you put 15 poker players in 1 room, they want to prove themselves. We decided that we had to play a Team Online Sit & go. Sure a regular SNG would be too easy, so we decided it had to be a 8-game SNG. We ended up playing an 11-handed, 8-game SNG which is pretty ridiculous because a lot of games in the 8-game rotation can’t even be played with 11 people. Some people (like Tyler Frost) didn’t even know how to play any other game then Hold’em or Omaha so we explained some of the rules while switching to the specific game. This resulted in Grzegorz “DaWarsaw” Mikielewicz throwing away the 2nd nuts in Razz, because Andre could only have the nuts (pure bluff) and Tyler checking back a wheel/straight on 6th and 7th street in Stud-8. Let’s say that the table was pretty soft 😉 That didn’t really matter because we played mainly for fun and only had a small last longer bet going. Obviously the guy who didn’t want to participate in the last longer and didn’t know most of the games won. As you can see I had to cry myself asleep while Tyler was the happiest Team Online of the evening. Unfortunately the trip had to come to an end. The last evening we planned a big diner at Nobu where we all enjoyed the great Sushi and other Japanese cuisine. For most of the Team Online members this had been a great trip, either because they cashed or even won (Talonchick won the Omaha/Stud Hi/Lo $1k event) playing poker or because they just had a lot of fun at the pool or in the club. For poker players it’s pretty normal that at the end of the evening the bill is getting paid by the loser in a game called Credit Card Roulette. It’s pretty simple: You put all Credit Cards in one big hat, you let the waitress pick the credit card and whoever owns that credit card most pay the whole bill. I normally don’t hang out with a lot of poker players so this was only the 2nd time I played it. We played a different version where not the credit card which was picked had to pay but that credit card was out, so we would draw credit cards until there was only 1 left and that one had to pay. Obviously it was me and Javier ‘El_Cañonero’ Dominguez left and I opted to split the bill among the two of us. In the end we gambled and I lost, resulting in me having to pay a $1300+ diner. Since I had to get out of bed at 04:00 and it was already 00:00 I decided not to go to bed. I wasn’t planning on drinking but the club was open and many people would leave the next day so everybody was planning to go out. 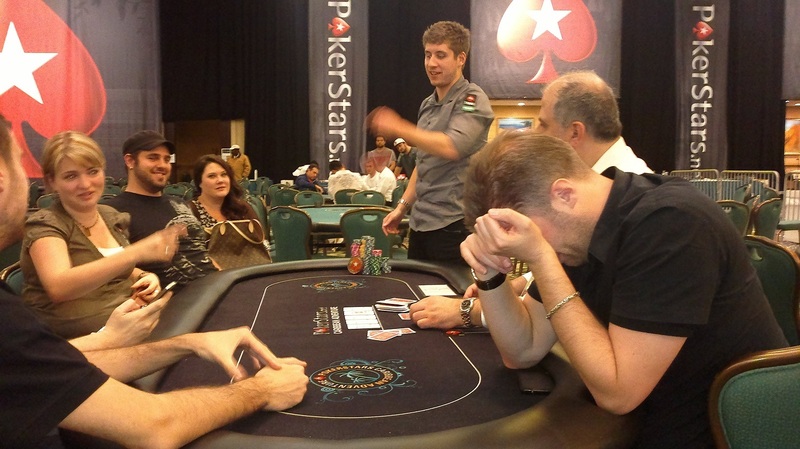 We joined up with Caleb and some of the other PokerStars employees for another fun night out. 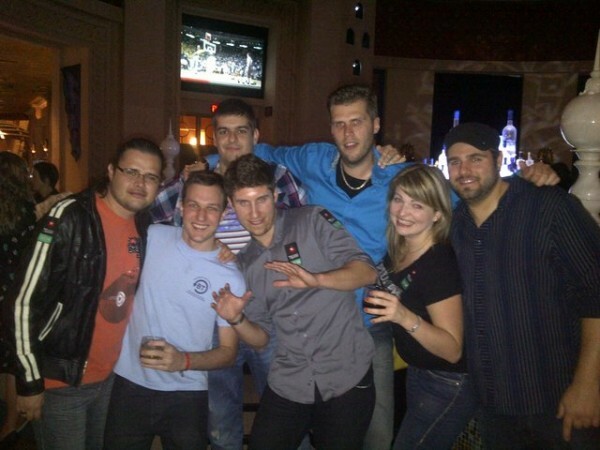 This was probably the best poker trip I’ve ever had. Meeting a lot of cool Team Online Members (& friends) but also getting to know the people behind PokerStars which is really important as I’m representing PokerStars as a Sponsored player. Knowing that there are so many poker loving and dedicated people working for PokerStars just makes it so much easier for me the be proud on being a member of PokerStars Team: Online. Unfortunately the tennis was no hustle, my favorite part of my game is my inconsistency…that, and getting partnered with Deigo! Poker highlight definitely was destroying the rest of the team in the 8game SNG, mostly due to skill. Lowlight was probably not having the stones to hit on Liv and then drunk tweeting about it while tagging her in the tweet…good trip though!